One of Chicago's largest high class and most unique apartment houses, 1150 feet front, with lagoon, tennis courts, conservatory, etc. Circa 1911. I assume this building is no longer standing? Or is it? This one's had me puzzled. The address of the current "Hotel" Chateau is 3838 N. Broadway, at West Sheridan, where Clarendon merges into Broadway, so the intersection would be about right; but the building looks wrong. The little spit of Clarendon isn't covered by Google maps, and I haven't had a chance to get over there yet for a look. I do have another postcard of the hotel here. On historicaerials.com it appears that this courtyard building is where Gill Park is now. The front is on Sheridan. It looks like the existing Hotel Chateau was part of this complex. I didn't even think to look on historicalaerials.com, thanks for checking that. I grew up near here and still pass frequently so was interested in this comparison btw the current Chateau and the former one (of which I was unaware until your postcard post.) I did some follow-up research and found a number of articles and ads in the Chicago Tribune archives. 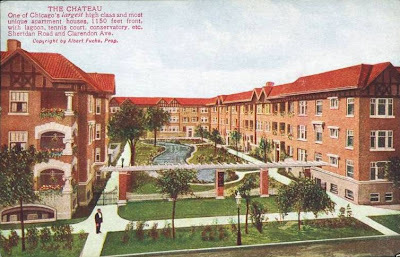 The old Chateau’s address was 819 Sheridan and it was built in about 1907. The owner, Albert Fuchs, became quite the real estate baron and was featured in numerous articles in the Trib, starting in 1892. He owned greenhouses in the area and started as a florist, lived at 1149 Sheridan, appeared in debtor's court, was accused by his musician wife of forcing her to pose with other women and she sought “separate maintenance” in court, sued a Congressman for rent money, got into tiffs over the flag and defended German officers behavior during WW1, had to endure his son changing his last name to "Fox" (less Germanic), had other real estate dealings on Bittersweet and downtown, moved to California in 1927, offered all his wealth to cancer research upon his wife's death in 1928, was arrested in Santa Monica to face morals charges in 1934, was acquitted and was “penniless” although he lived in mansion. I dug a bit into the LA Times archives to find out what ultimately happened to him, but no luck without paying. From a Trib article on 10/11/22, the old Chateau was to be demolished to make way for a new (current) hotel which was to be called The Broadway, to be built in 3 sections and include a 5,000 seat theater. But a subsequent 1927 article refers to Fuchs leasing his holdings of The Broadway Hotel, the Chateau apartments and a 1,600 seat theater (that also contained a bowling alley and "bachelor apts") to a syndicate when he moved to California. So apparently he built the hotel but left the courtyard apartments, or at least part of them. Also, it looks like the courtyard was there in the 1962 historic aerial, so perhaps the Chateau was built adjacent to them and then they were eventually torn down. Regarding the Chateau Theater, a 1930 article gave the theater's address as 3810 Broadway. Apparently Fuchs owned the entire block to Grace. There is a good article on Cinema Treasures about the Chateau, later called Vogue, Theater (see http://cinematreasures.org/theater/4504/). Two of the Dillinger gang’s girfriends, Pat Cherrington and Opal Long, lived at The Chateau and were arrested there on June 2, 1934.